We know you want one. 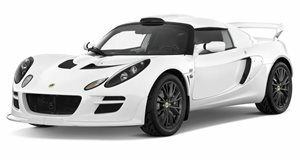 Although we’re still waiting for the arrival of completely new models from Lotus, we have nothing but the utmost respect for the UK sports car company for making the most out of what it currently has. The latest example is the newly revealed Exige Race 380, the track-only version of the also new Exige Sport 380. The Exige Race 380, however, was developed to be eligible for the world-wide Lotus Cup series as well as other clubman championships. Once again, power comes from a supercharged 3.5-liter V6 with 375 hp at 6,700 rpm and 302 lb-ft of torque at 5,000 rpm. Instead of a conventional manual gearbox, Lotus equipped the Race 380 with a six-speed sequential transmission in order to extract every ounce of performance. There’s also a unique air cooler and cassette-type plate limited slip differential, which is operated by carbon paddles placed behind the steering wheel. A full titanium exhaust system shaves off an additional 22 pounds from beyond the rear axle. Performance? Try 0-60 mph in only 3.2 seconds. It alsond lapped Lotus’s own Hethel test track in 1:23.5 – the fastest ever for an Exige. Other track-specific bits include increased downforce thanks to improved aerodynamics, vents incorporated into the front bodywork and rear bumper to reduce pressure around the wheels, and a grille mounted at the rear to aid circulation through the engine bay. There’s also a new front splitter. Step inside and you’ll find a full, integrated roll cage and a lightweight FIA Carbon driver seat with a six-point harness. There’s even track data logger and a TFT color instrument display with a number of customizable and programmable screen configurations. Although it’s not set for US sales, you can head over to the UK and pick one up for 99,000 GBP, plus VAT.